Square / Rectangle Planters 2'x6'x24", 2'x2'x18.5" and 1.5'x3'x13"
Square and rectangle planter boxes are ideal for container gardening in small urban spaces such as a deck or patio, balcony or rooftop. They work great alone or in combination with L-shaped planters and garden trellises to enclose an area with flowering vines, fragrant herbs and vegetables. 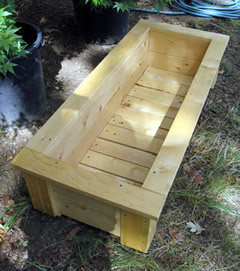 Planter boxes are made from the same rot-resistant cedar and non-toxic sealant as our popular raised beds. Assembly is easy, and with our flexible kit system you can build planters in almost any shape or size, including custom planter designs. If you are looking for something in particular, please don't hesitate to ask. We'll help you build the perfect container garden. Easy assembly—stack boards and insert corner pins. Attach trim pack and bottom with included screws. Build planter boxes in endless shapes and sizes!